Climate change is increasing the frequency and intensity of extreme weather events around the world, sparing no country. Research from the Washington-based National Climate Assessment establishes a direct link between a warmer climate and heavier downpours: hotter air can hold more moisture, meaning there’s more water available “for storms to wring out of the atmosphere”. Touted as the most powerful hurricane to hit Texas in more than 50 years, Harvey has been responsible for killing more than 50 people, displacing more than 1 million and damaging nearly 0.2 million homes. The combined losses could cost the state exchequer around US $180 billion, the maximum losses ever incurred due to a single natural disaster in the US. Moreover, since most of the houses do not have flood insurance, 70 per cent of home losses would not be recovered, reveals CoreLogic, a property analytics firm in the US. In 2013, Texas came up with its hazard mitigation plan, but the document does not mention climate change and its impacts. Back in the subcontinent, we see a somewhat similar, yet different picture. Mumbai received its heaviest rainfall since 2005—315 mm in a single day. 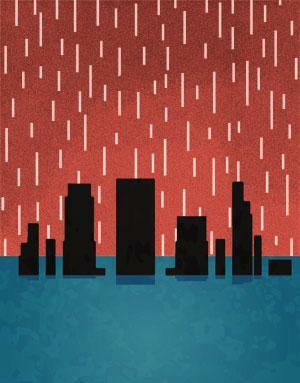 Since it was one-third of what it received in the 2005 floods, the impacts were far lesser. Even then, at least 20 people were killed and nearly the same number injured. Normal life was thrown out of gear with the disruption of trains, flights and traffic services. However, unlike Texas, the problem with Mumbai is to do with poor urban planning. Overflowing drains, unregulated construction on natural drains and riverbeds, poor drainage systems and the disappearance of mangroves reflect the state of planning which precipitated the devastating floods. Climate change has certainly exacerbated the impacts. Another issue in case of Mumbai was that by the time floods ravaged India, the city of Mumbai had already received 2,000 mm of rainfall since the onset of monsoon in June, and so it was already saturated in terms of its moisture retention capacity. It struggled to accommodate more rainfall. As for relief and response, Mumbai has not yet learned its lessons from the previous flood experiences. The city was not equipped to handle the floods even though the India Meteorological Department had predicted heavy to very heavy rains. Like in 2005, there was little coordination among state and local authorities and institutions, including the Mumbai Metropolitan Region Development Authority, the Mumbai Metro Rail Corporation Limited and the Slum Redevelopment Authority. Though there cannot be a comparison of Texas and Mumbai in terms of how the cities responded to extreme weather events due to the sheer size, state of economy and geographical factors, it turns out that the disaster response and preparedness in both the US and India is underdeveloped. Under the US disaster relief policy, homeowners get no federal relief for reconstruction of houses damaged or lost due to floods. The country also has a federally-supported national flood insurance programme, but it currently has a debt of US $25 billion and is struggling for funds. In India, we have disaster management structures including the National Disaster Management Authority and their state and district counterparts. Though the approach is to strengthen disaster preparedness, mitigation and emergency response, we have not seen the effectiveness of this approach in practice. Disaster risk reduction needs to be mainstreamed and integrated across all sectors. Institutions need to be strengthened and capacity building needs to be prioritised. Additionally, funds are a major issue with the states struggling to divert their resources to address disasters. Nevertheless, the good thing is that India is recognising the challenge of climate change and the need for mitigation and adaptation to deal with climate change, unlike the US, which, under Donald Trump, has shown disbelief in the climate change phenomena.